Honestly, Oblivion is a film that is a challenge to critique. Not that it doesn’t have weaknesses. The problem is, it’s assembled from parts of many other science-fiction movies, and naming those films would necessitate one big spoiler alert. Spoiler alerts are for the weak, so let’s tread lightly and say that Tom Cruise stars as Jack (can we give this character name a rest please?) one of the last “drone repairmen” on Earth. After decades of war with the invading Scavs, the planet was left devastated. Though victorious, most of humanity has relocated to a moon of Saturn, while Jack and his sparse mop up crew hang around to harvest resources and keep the drones working efficiently. When a strange vessel crash lands, Jack defies orders and investigates, setting in motion a tumultuous chain of events. 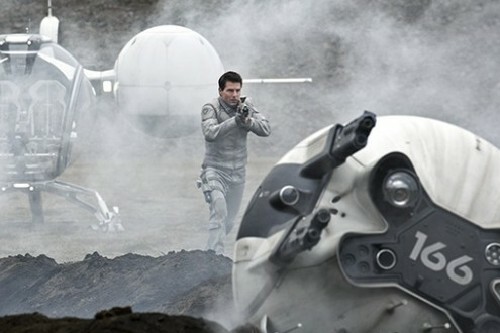 While it may be true that sci-fi films have been borrowing from each other forever, Oblivion takes it up a notch. Not only are certain themes and plot devices instantly recognizable, but images and scenes considered at least famous (and at most, iconic) are shamelessly recreated. Director/co-writer Joseph Kosinski, in just his second feature (after TRON: Legacy ) expands the story he first pitched as an eight –page treatment for a graphic novel. It seems he was thinking visually from the start, and it shows. Oblivion is gorgeous, showcasing a wondrous sci-fi world full of eye-popping cinematography (especially effective in the IMAX version). From Jack’s outpost-in-the-clouds to his trips to the Earth’s surface in a pretty bitchin’ spacecraft, there is fertile ground for the type of poetic message Kosinski is after. For a while, the substance keeps pace with the style, but it’s slowly bogged down by a script that ultimately can’t deliver the profundity it strives for. There is some humanity here, but not enough originality to keep the film from feeling overlong . Tom Cruise is Tom Cruise, with the usual brand of charming intensity we’ve come to expect. Kosinski is still new to the game, but if his storytelling skills ever match his visual flair, he’ll be a player.